Doing my first whole turkey ever today. Just shy of 11 pounds. Rubbed it inside and out w/Tony Chachere's Salt Free Seasoning and left it in the fridge overnight. Goin on the WSM at 275. Gonna start checking temps in about 45min or so. Will post the finished and plated pics later. 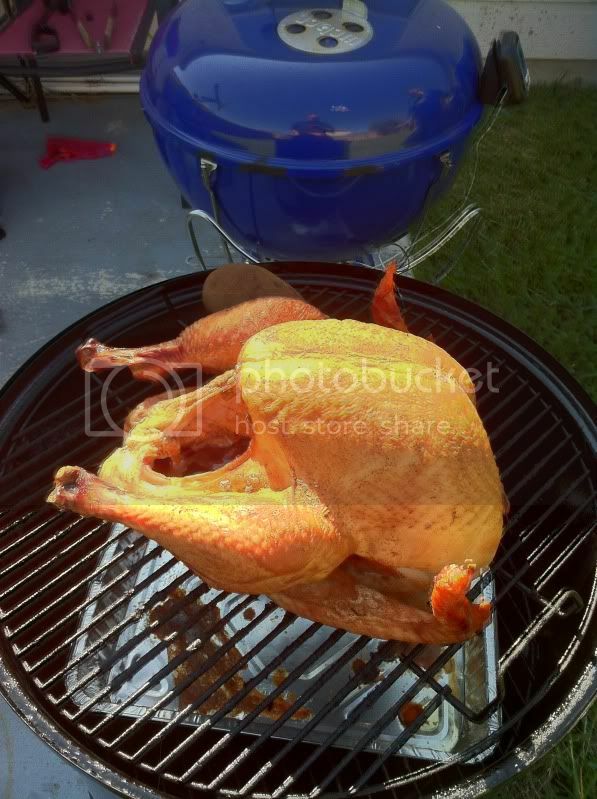 And..........where else do you see a turkey cookin' with a sweet ole' Blue in the background? Looks really nice so far.........should be delectable at the end !!!!!! Here it is coming off before getting a parchment paper/foil wrap and into the cooler for a 30min rest. 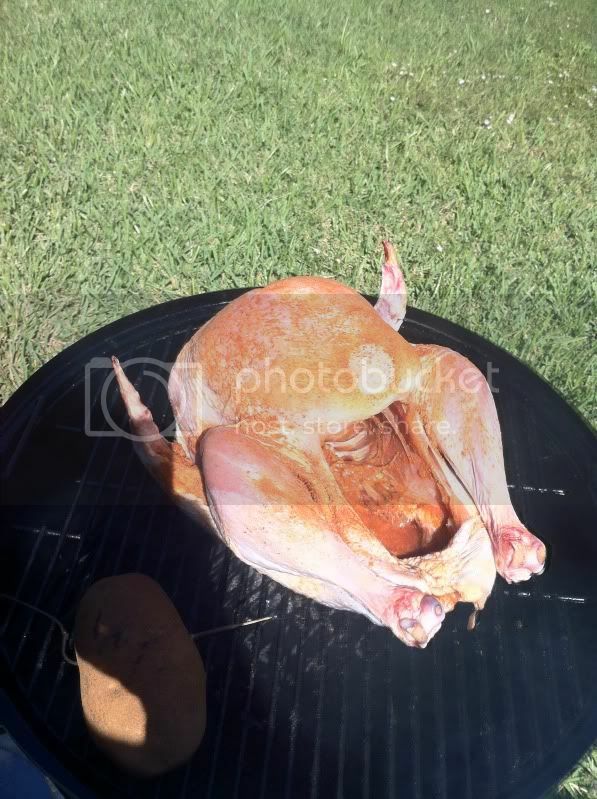 How did the skin turn out - was it crispy? It looks crispy. 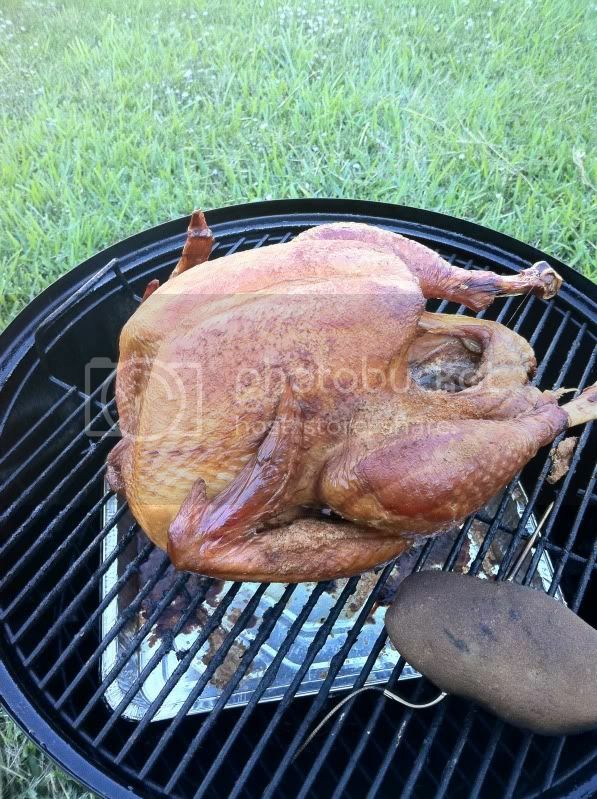 I was thinking about doing the Thanksgiving turkey on the WSM but was afraid that the temp wouldn't get high enough to crisp up the skin and that it would be soggy/rubbery. Well, the 30 min rest wound up being an hour. 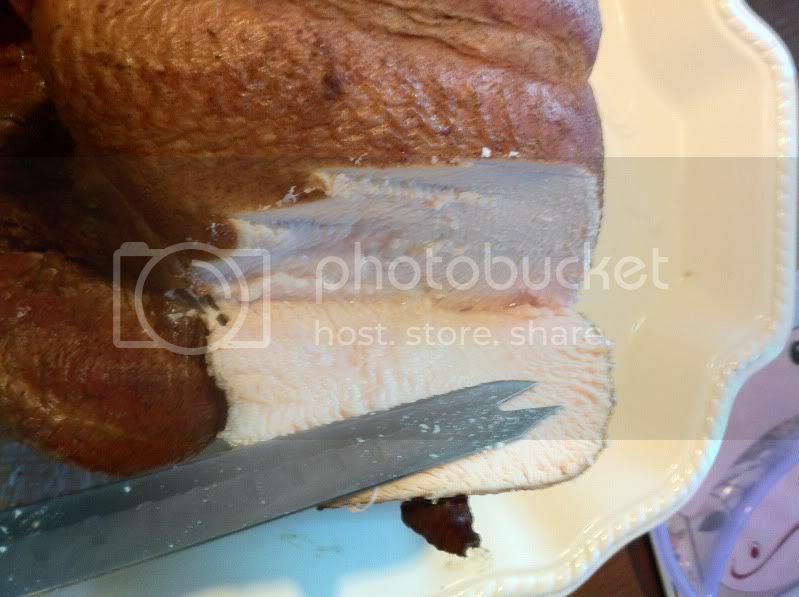 Very happy with it especially considering it's my first whole turkey of any type. 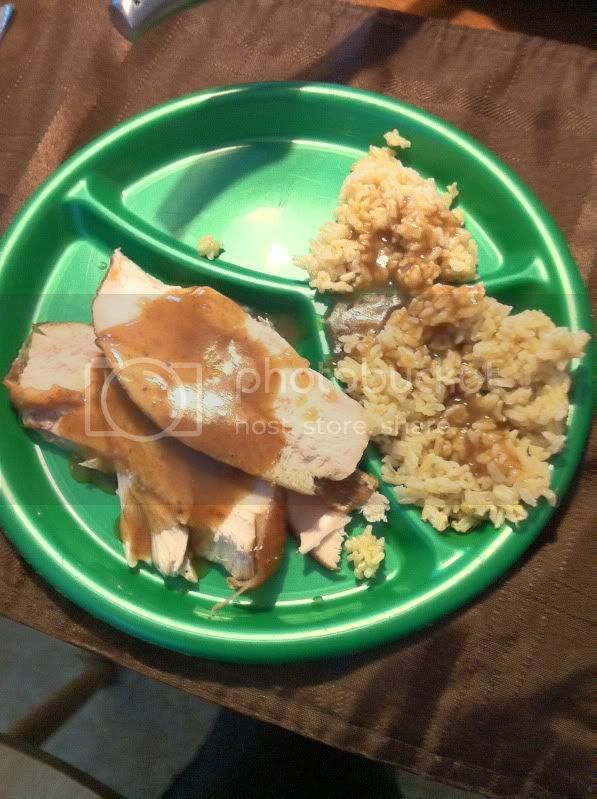 The seasoning added a very peppery flavor to everything(drippings were collected and added to the included gravy packet). While a very good flavor, I'm gonna have to think of something less peppery when it comes to the big day since not all of my family likes their food to have a nice bite to it. a bit tough. even w/the longer rest, it wasn't rubbery at all. not leather by any means though. the skin on the legs and wings was the worst. the thigh and breast skin was actually pretty good. just realized I forgot to say that the fuel was some of the last of my stash of the Wal-Mart branded RO briquettes and some pecan wood for smoke. looks good! Im having a turkey-off with sister this year. I need to do a tester before the big day. I havent ever cooked one yet either let alone grill one. thanks, it's all I could think of to keep the probe near the grate w/o having the heat induction from metal(ie-a foil holder). Thinking about what to do next time really resonates with me. I write down detailed information about every big cook so I can duplicate good results. I end each record with thoughts about what I want to do next time to make it better. I store it in a manner that easy to find and reference when planning my next took. (In my case, a blog.) That will help you to take your game to the next level. You're already off to a good start!